More frequent checks control MRSA in newborns, but can hospitals afford them? The more often a hospital can check its newborns for deadly MRSA germs, the more likely it will be that they are contained, according to a new study. However, researchers noted that there are significant barriers to the frequency of this surveillance, including cost and available facilities. "The two competing factors seem to be the potential for harm to patients versus the costs. Infection prevention strategies are not cheap," said Neal D. Goldstein, Ph.D., assistant research professor in Drexel University's Dornsife School of Public Health and the study's lead author. "But our analysis shows that the cost of surveillance was, in fact, much less than the cost resulting from an infection, which leads to longer hospital stays, more medical care and potential for future disabilities." Infants are especially susceptible to MRSA, or methicillin-resistant Staphylococcus aureus. 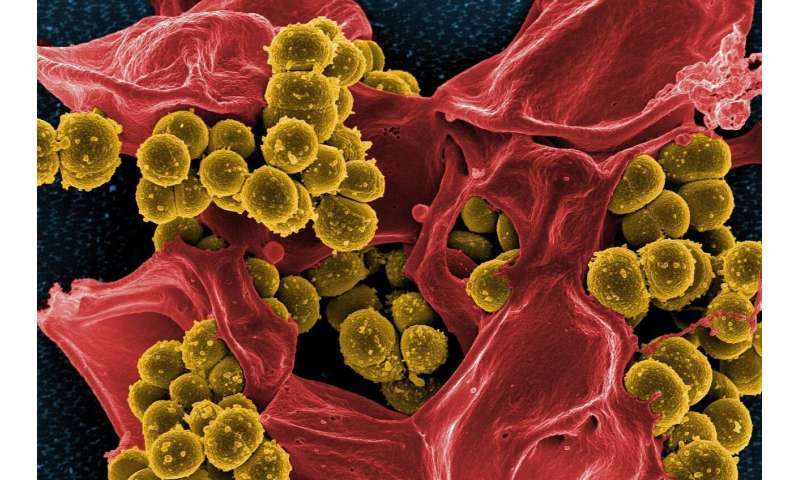 "About 30 percent of babies that MRSA colonizes—meaning that the germs are present in or on their body—will go on to develop an invasive infection, possibly leading to severe illness or even death," Goldstein explained. Incidences of infections in newborns rose 308 percent between 1995 and 2004, and each infection was associated with a patient spending an extra 40 days and $164,301 in the hospital. Goldstein has actually already studied one method for lowering MRSA transmission rates in the NICU (neonatal intensive care unit): Higher standards of hand hygiene. Although that study found that better levels of hand hygiene resulted in lower transmission rates, he still found that even perfect hand hygiene would not completely stop it. So Goldstein modeled this new study, published in the Journal of Hospital Infection, after the NICU at Christiana Care Health System in Delaware—where Goldstein serves as an epidemiologist—to study how different protocols for MRSA surveillance might play out. Using mathematical equations to simulate patient care of the Christiana Care NICU, his team evaluated a MRSA surveillance program. Four different surveillance periods were assessed, including checking infants for MRSA weekly, biweekly, monthly, and another policy that varied the period dynamically. Compared to the monthly surveillance, the once-per-week checks were found to lower the number of infants colonized by MRSA by about 80 percent, from an average of 2.9 to 0.6. Additionally, the average duration of MRSA colonization went down from 307 hours to 61 hours, another 80 percent drop. The study stopped at one-week surveillance, but begs the question: Would even smaller intervals between surveillance be better? "One may try to extrapolate from these data and think a daily policy of MRSA surveillance is desirable," Goldstein said. "Yet, as we show, this ends up limiting important resources that may be needed for other patients." Isolation rooms are used in NICUs to keep infected patients apart from others to reduce transmission. But the study found that the availability of isolation rooms actually fell when going from four-week to one-week surveillance: half of the infants who were colonized by MRSA eventually weren't able to be isolated because the rooms were already in use. "While it may sound like more isolation rooms are a better thing, this results in fundamental changes in care practices that can disrupt workflow," Goldstein said. "Further, our simulation shows that MRSA in the NICU ebbs and flows, and, in fact, too frequent surveillance will waste resources in periods when there are no infants with MRSA colonization." Over six months, the simulation showed that a weekly surveillance program would cost between $15,000 and $98,000, while a once-every-four-week program was estimated at $3,500 to $23,000, roughly four times less expensive. This expenditure must be balanced with the cost of having an infant potential develop a serious infection, which prolongs the length of stay and has the potential for future disability. According to Goldstein, "An infant who goes on to have invasive disease from MRSA can lead to costs to the healthcare system in excess of $100,000." Hospitals will continue to face a tough balance between keeping newborns free of potentially harmful germs and making the bottom line work for staffing and resources. As such, Goldstein said future work "may look at other ways to protect MRSA-colonized babies without using an isolation room." "For example, doing something called isolation in situ—where the infant is not moved, but contact precautions are used in their existing bed location—can be explored," Goldstein explained. "Strategies for infection prevention have real implications for NICU design, layout, and staff workloads." Goldstein hopes other institutions could run simulations similar to what he and his team did to more accurately reflect their own situations in the NICU. In the meantime, though, Goldstein feels this simulation again demonstrates what he concluded in his earlier NICU hand hygiene study. "An effective infection control program should not overly rely on any singular strategy," he concluded. "Hand hygiene is not foolproof and isolation rooms may not always be available. We need to think about the right combination of every strategy."